iHerb’s supply chain gets a vitamin boost by incorporating a first-of-its-kind robotic technology to assure orders are processed quickly and accurately. iHERB, a pure-play internet retailer has boosted productivity and reduced labor in processing up to 40,000 orders a day at its new distribution center in Hebron, Ky. At the heart of the facility is a new goods-to-person order picking system that incorporates iBOT robotic technology. The system easily handles almost all of the company’s 35,000 different products. These include a wide variety of goods designed for a healthy lifestyle, such as green and organic products, vitamins, nutritional foods and supplements, organic cleaning products, natural make-ups and lip balms, and more. iHerb began shipping from this, its second distribution center, in July. The new facility has eased the strain on the company’s original operations in California. Hebron was chosen because it can easily reach the East Coast and is near DHL’s air hub in Covington, which allows fast access to the international customers that comprise a significant portion of iHerb’s business. 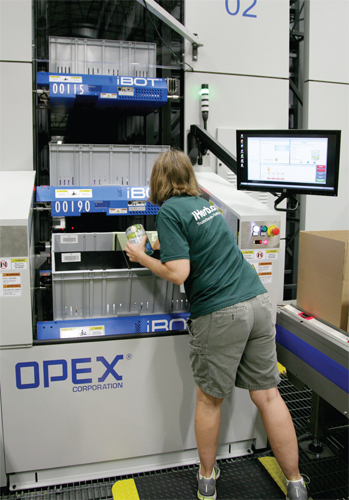 Bastian Solutions was selected to design and integrate materials handling systems at the new Hebron facility, which centers on Perfect Pick, a first-of-its-kind order picking technology from OPEX Corporation. The majority of iHerb’s orders consist of only a few items, and filling these requires fast access to the full range of SKUs. The OPEX Perfect Pick is ideal for this application. The installation at iHerb offers a small footprint, yet holds about 3 million units. Since most of iHerb’s SKUs have small dimensions, nearly all can be accommodated within the 17,000 tote locations of the Perfect Pick system. Each tote is configured to have four or eight storage compartments, depending on the space required for each product size. This allows each tote to hold up to eight different SKUs. The totes are housed in what looks like a huge floor-to-ceiling box located in the middle of the distribution center. Inside are storage racks comprising 10 aisles, where small autonomous robots, called iBOTs, move horizontally and vertically throughout – 10 to 15 iBOTs per aisle. Highvelocity SKUs are mirrored across multiple aisles in Perfect Pick to provide multiple picking scenarios and maximize throughput. As orders are received, the Bastian Solutions Exacta warehouse control system assigns them to 20 goods-to-person picking stations, while also directing a steady flow of cartons to the appropriate station. The iBOTs then transport source totes holding iHerb products from the storage locations to the pick stations. Upon delivery, the iBOT tilts to present the tote to the worker at an ergonomic angle for product selection. Since each source tote may have as many as eight different SKUs housed in its storage compartments, a light is automatically projected from above the tote into the compartment that contains the required item. This assures very high picking accuracy. To further enhance quality, a picture of the item and UPC are shown on a nearby computer display, which also directs the worker as to how many items of that SKU to pick for each order. The worker selects the required amount and places them into the staged order cartons, as directed by put lights. The facility has been so successful thus far in processing orders that iHerb managers consider the Hebron DC design to be the blueprint for all future operations. Click here to view the original source by DC Velocity, "The Pick of the Lot."